Photo. 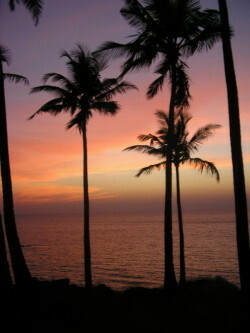 Sunset at the Palolem Beach in Goa. Things seem to be hotting up a little now, an hour later, although the music selection has been uniformly bad - Red, Red Wine by UB40 excepted and that's purely for nostalgic reasons as it reminds me of my first girlfriend. It's Bryan Adams now, proceeded by Nirvana, Paul McCartney and Pink Floyd. It's a 80s throwback. I realise that in India, like anywhere, a big town can be lonely. Pune is 3.8m. I will go to Osho's ranch tomorrow, and check out the Sanyassi's who I already know give me the heebie-jeebies (shiny eyed and very serious looking people wearing orange saris who follow the late Rolls Royce love guru who they say was poisoned by the Americans before he died in 1990. 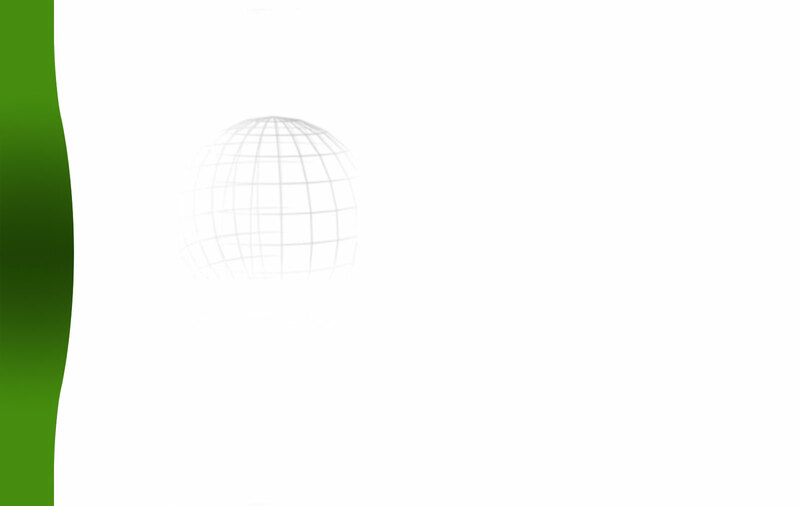 For the first time I see India's cool and sophisticated face. Young men and women out on their own. Nobody here pays nobody no mind. I am just an English fish out of water, in a pub called 10 Downing Street. I wonder if Tony Blair would feel at home here - the tunes might be more up his street. Photo. 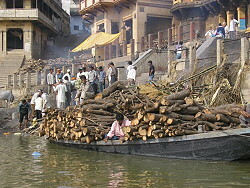 Burning Ghat at Varanasi. © Joe Gill. The DJ keeps up the same selection - he plays not one but two Billy Ocean records. I wish they'd play those cheesy breezy Indian Bollywood tunes instead. They are so uniformly upbeat. As I nurse my drink I am befriended by Krishna, who's a cool looking guy with goaty beard and silver neck chain. He is out with his girlfriend Monica. Krishna is super friendly and his eyes smile so strongly I almost squint. We get talking. They are neighbours who started dating, they are going to get married. I feel wistful at their undisguised happiness together. Krishna says, 'heh, Joe, what's happened? Don't give any mind to the world.' He gets up and dances to Billy Ocean, and perhaps feeling sorry for me insists I dance with Monica, and I oblige happily. Photos. Life at Palolem Beach in Goa. © Joe Gill. 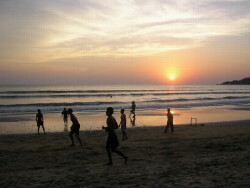 At the left photo a girl is running on the beach, and at the photo to the right, boys are playing cricket. He is from Goa, a Hindu. I tell him I am on my way there and he promises I will 'freak out' with the drink, girls and drugs. Monica is doing a PhD in Eng lit at Pune University, by all accounts the country's best (although another Eng Lit grad I met at Benares University said Delhi was top for Literature). Anyway Monica and Krishna are both call centre agent. That is the people who call me most often while I am in bed at the weekend or as soon as I get in from work. He works for a BT owned group, she works for a US company. Krishna tells me that 20 % of his English customers slam the phone down saying they don't want to talk to an Indian,' but 80 % are polite, and they appreciate the Indians are doing a job and they don't use bad language. He is saying this not just because I am English, Krishna assures me. Monica says the Americans are much ruder. They use every bad world under the sun, "they refuse to talk to me saying I want to talk to an American". Krishna recounts conversations with people called on Sunday morning who are nursing hangovers and don't want to talk - as everyone who's ever taken one of those calls can testify. One woman said to Krishna, 'my boyfriend has just f***ed me nine times and I can't talk right now, I am applying cream to my c***'. Photo. 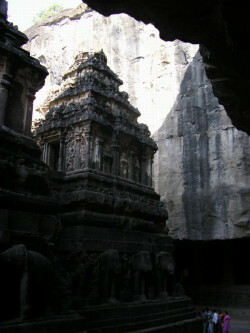 A temple in the Ellora caves in Maharashtra. Monica, in similar vein, called an American woman in the middle of a Sunday morning work out who, amid gasps and moans, showed a talent for multi-tasking or indifference to her lover by insisting that Monica continue to describe the cell phones she was selling, 'Go on, Go on'. Overall, it seems Americans were foul mouthed and highly resentful, reflecting perhaps the greater anger over outsourcing and off shoring in the States. Did all this make the work unbearable? Apparently not. Despite the abuse, fake identities and unsocial hours - America is 10 hours behind India so to call in the morning means working at midnight - they both said they liked the job. Krishna said: "It's an amazing job. You are talking to people in London, New York, Australia, it's like travelling all over the world and making new friends from thousands of miles away, every day.' He points out most Indians can't afford to travel abroad, so this is a huge bonus for job satisfaction. Monica said that despite both of them having to use false names, and bizarrely provide a false surname to conform with call centre regulations on customer service, it was quite easy to fool Americans into thinking she was one of them. Many of her customers were actually Indian Americans concentrated in Chicago, so a rapor was easy. Krishna said the Brits knew he was an Indian not using his real name, and sometimes insisted on the real thing. Monica's English is impeccable if accented, she does a passable American accent. Krishna could make up for his accent with pure bonhomie. As for the way the call centres pester people at unsocial hours to maximise the pick-up rates on the calls, it did not seem to be an issue for these two call centre workers, it was just part of the job. With so many good English speakers in cities like Pune, Bombay, and Bangalore, Maharashtra is the hub of the off shoring call centre industry. If these two were at all representative, it is clearly a status job, even though newspaper reports here speak of high turnover and depression among staff who cannot cope with the abuse from western customers. These two were made of sterner stuff it seemed, and Krishna certainly enjoyed those big Whiskies. We made a dash for the door at 12.30am. I got a rickshaw home while Krishna and Monica got on their scooter and looking like the cool kids they were drove off into the equally cool Pune night. 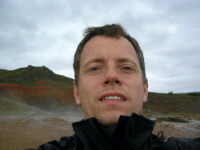 Read more of Joe Gill`s stories on our global travel guide Travel Explorations. As Lonely Planet describe India: "Nothing in the country is ever quite predictable; the only thing to expect is the unexpected, which comes in many forms and will always want to sit next to you. 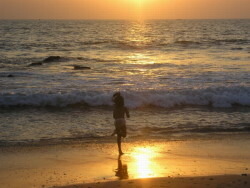 India is a litmus test for many travellers - some are only too happy to leave, while others stay for a lifetime". For more information, click on the link: www.LonelyPlanet.com.